PRADIPTA, Giva and PUJIYONO, Arif (2016) STRATEGI PENDIRIAN BANK PERTANIAN SYARIAH UNTUK MENINGKATKAN PEMBIAYAAN PERTANIAN DI PROVINSI JAWA TENGAH DENGAN METODE ANALYTICAL NETWORKING PROCESS. Undergraduate thesis, Fakultas Ekonomika dan Bisnis. The role of the agricultural sector nowadays is very strategic in the national economy, but it has not been balanced yet with the the provision of adequate capital support. The proportion of the distribution of funding on Islamic banking institutions are still low to the agricultural sector, so it could lead to the emergence of consideration in the establishment of banks that specifically financing for the agricultural sector. One of the proposed financial institution is sharia agricultural bank, as a potential financing for agriculture in Central Java province. However, the potential is inhibited by some constraints such as management problems, human resources, government, infrastructure and socialization which still not formulated yet in the establishment of sharia agricultural bank. 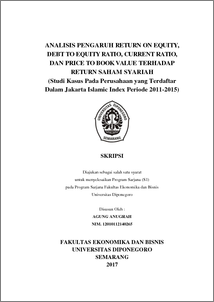 This study aims to analyze the appropriate strategy to make the establishment of sharia agricultural bank, to improve the agricultural financing in Central Java province. This study uses Analytical Network Process (ANP) method. The results of the analysis of ANP showed that five aspects of agricultural bank establishment to improve the agricultural financing in Central Java province produces management aspects as a priority in supporting of sharia agricultural bank commitment, whereas it provided agricultural financing according to the rules of fiqih muamalah and followed by government support in the establishment sharia agricultural bank in licensing and investments, also improving the quality of human resources by providing training. Recommended strategies will multiply the socialization of agriculture financing in the sharia agricultural bank supported by proper infrastructures in agricultural areas.